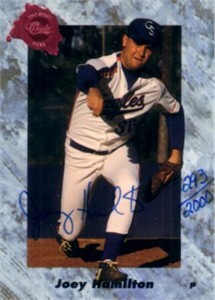 1991 Classic Four Sport certified autograph card of former Padres pitcher Joey Hamilton, a member of the starting rotation for the 1996 NL West Championship and 1998 National League Championship teams. Numbered out of 2000 produced. ONLY ONE AVAILABLE FOR SALE.